Welcome to Content Corner! It will take a day or two for us to get you set up in the system. Once you receive your login details, here are instructions to get started and send your first email newsletter. If you haven't already, be sure to sign up for your 30-day free trial. Tip: you can click any of the images below to see them in a larger size. As part of your free trial of Content Corner, you'll get full access to our email newsletter service, MyNewsletterBuilder. Once you receive your login credentials, go log in here. If you didn't receive this or need any assistance, contact us. With just a few clicks, you can add your subscribers. At the top of the page, click Subscribers. Click Import on the left side of the page. Select a CSV file with your subscriber list. We have a template you can download here if needed. If you need any assistance adding your subscribers, contact us. Now, go back to the dashboard. 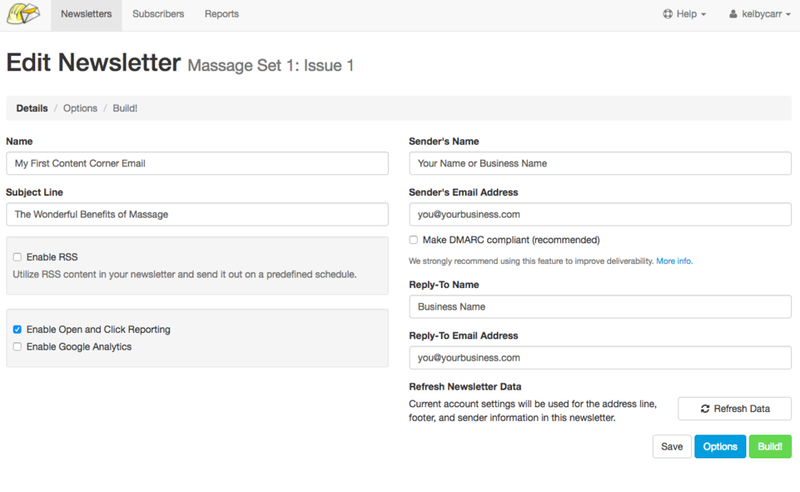 This will take you to your pre-filled newsletter so you can make any adjustments and click send. On this page, confirm or update in details about the email such as subject line, sender name, etc. Click Build button at the bottom right. Confirm your business details are at the top, or click to edit and update. Check over the newsletter to make any changes. Simply click to edit any section. Once you've checked it over, click the Save & Schedule/Send black button at the bottom right.